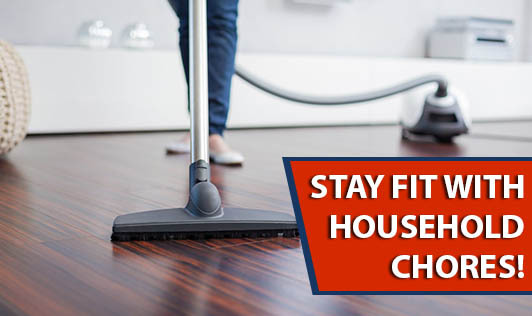 Stay fit with household chores! A hectic life, jam-packed schedules and never ending chores, just don't seem to leave much time for exercise and fitness. Since exercise has enormous health benefits, a busy life is no reason to forgo daily exercise. With little creativity and time management, we can make exercise part of our routine, no matter how long our to-do list is. Here are some activities that can sneak in some calorie burning into the chores that you are already doing. While you take care of those dirty dusty floors, with an hour of mopping, you can burn 153 calories. If your floors require a little extra cleaning, you can easily shed 187 calories by scrubbing the floors in 30 minutes. It takes that extra energy to get rid of the soap scum in the tub. Cleaning the tub can make you shed 90 calories in 15 minutes. A 30 minute exercise with the broom while sweeping can burn 136 calories. Scrub and wash your car yourself to burn 153 calories in 30 minutes. Let the sunlight enter through a clean window. 30 minutes of cleaning windows will help you burn 167 calories. Rearranging your closet for the new season can burn 85 calories an hour. Washing a mountain of dirty dishes can burn 76 calories in 30 minutes. (Estimation of calories burnt is based on an individual weighing approximately 65kg). Try to maintain a time limit to finish these chores, so that you keep up with the number of calories you can burn through that activity. These activities not only help in burning calories, but also help to tone the muscles of the arms, legs, chest, abs and buttocks. Exercise should always be supplemented with cardiovascular exercises. Always make exercise a priority. But, on days when your to-do list is long, doing chores with little extra energy and vigor is a great way to multitask!